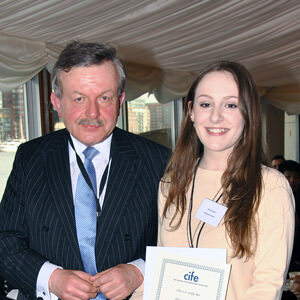 Each year CIFE awards a number of prizes to exceptional students from member colleges. Competition is fierce, and we’re delighted to announce that Grace Tucker (seen below with CIFE President Lord Lexden) was awarded this year’s Ashbourne college prize. Grace studied A Levels in English Literature, French, Spanish and Drama and Theatre Studies at Ashbourne. She was one of our shining lights during her time with us both in terms of impressive academic achievement and her mature conduct. Grace achieved high grades in all of her subjects (A*AA) and is now at UCL studying Modern Languages. Grace demonstrated a degree of maturity and responsibility that is rare in a sixth form student which led us to name her Head Girl for her final academic year, a responsibility she fulfilled admirably. She is proactive and reliable, edited the Ashbourne College magazine, helped to organize extracurricular activities, was a mentor for our GCSE students and became a key member of our Critical Theory seminar.